Islamabad: Pakistani women that are brought under the umbrella of terrorism and radicalism are strong enough to shun odds off their success once they decide to follow their path. Pakistan is known for country of Malala Yousifzai who has bagged almost every important award of the world due to her resolve against terrorism. Sharmeen Obaid Chinoy of Pakistan bags three Emmy for her documentary film in during 2010-12. Samina Khayal Baig is a first Pakistani woman and the third Pakistani to climb Mount Everest. She is also the youngest Muslim woman to climb Everest, having done so at the age of 21. Now Samina is writing a new history by deciding to scale “7 Summits in 7 Continents”. She on move now. Samina Baig and her brother, Mirza Ali have started their journey on a unique season of mountain climb. The project namely “7 Summits in 7 Continents” is a major international project in which Samina and Ali Mirza will attempt to scale the highest peaks of all the seven continents of world. They have gone to attempt to climb Kilimanjaro, Denali, Elbrus, Aconcagua, Carstensz Pyramid, Vinson and Everest. Last week a farewell reception was held in Islamabad that was attended by five ambassadors of countries including USA where Samina and Ali are moving to climb. Speaking at the occasion the American Ambassador to Pakistan, Richard G. Olson, said that Samina Baig is an icon of commitment and excellence. Mirza and Samina have started their tour from Argentine to scale mount Aconcagua, 6,961 m (22,838 ft) high peak, located in the Andes. Baig belongs to a remote village of Hunza—Shimshal. 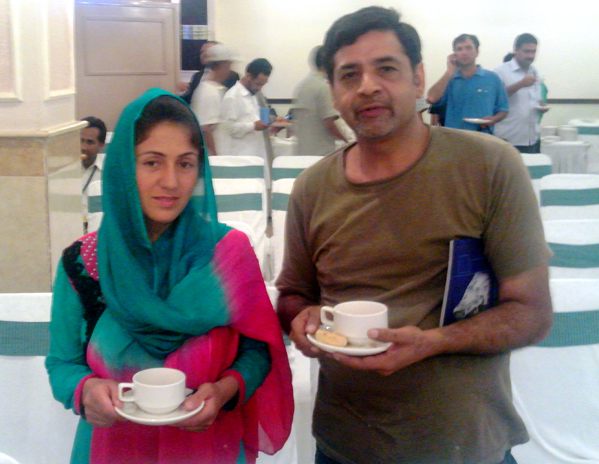 She was trained in mountaineering from the age of 15 by her brother, Mirza Ali. She is a student of Arts and began climbing when she was merely four years old. Samina Baig became the first Pakistani woman and the third Pakistani to climb Mount Everest on May 19, 2013. She was joined by Indian twin girls Tashi and Nancy Malik in climbing Mount Everest and they together perched national flags of India and Pakistan side-by-side atop the peak to spread a message of Indo-Pak friendship and peace. Commencing on April 1, 2013, Baig and company climbed the Nepalese south face of the mountain. The expedition to the summit took 48 days, the team traversed the South Col pass in eight hours, with the mountaineers reaching their goal on the sixtieth anniversary of Edmund Hilary and Sherpa Tenzing’s first successful conquest of Everest. Next articleWho is Lt Gen Raheel Sharif ?